The 2nd Ranger Battalion, currently based at Joint Base Lewis–McChord south of Seattle, Washington, United States, is the second of three ranger battalions belonging to the United States Army's 75th Ranger Regiment. On 6 June 1944, Dog, Easy, and Fox Companies, commanded by Lt. Colonel James Rudder, landed at Pointe du Hoc from LCA landing craft and specially modified DUKW "Ducks" operated by the Royal Navy. 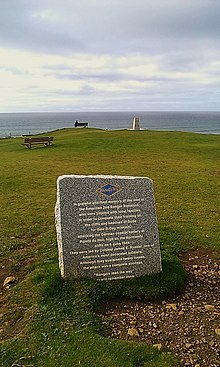 The 225 Rangers had set off from Britain to launch an assault upon the cliffs overlooking the English Channel. In order to augment the strength of the 2nd Battalion, members of what was formerly the 29th Rangers were assigned as well. Several landing craft containing Rangers and supplies capsized in the stormy waters and many Rangers drowned due to heavy equipment, but others were saved and hoisted into other DUKWs to participate in the attack. The Rangers had planned to land at the base of the cliffs at 0600 hours, however, because of a navigational error, they landed nearly an hour late. This cost the lives of more Rangers as well as the element of surprise. 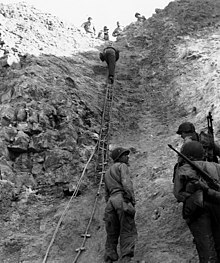 During the attack, the 190 remaining Rangers scaled the cliffs utilizing rope ladders, but only 90 Rangers were still able to bear arms after two days of relentless fighting. During the assault, 2nd Battalion managed to disable a battery of 155mm French artillery captured by the Germans, which was their primary objective. These guns were to be aimed at Utah Beach, however, the Rangers prevented their use, saving American lives on the shores of Normandy. Meanwhile, Able, Baker and Charlie Companies landed along with the 5th Rangers, the 1st Infantry Division and the 29th Infantry Division at Omaha Beach. They suffered extremely heavy casualties but were able to complete their D-Day objectives. Able alone lost up to 96% casualties with just two men making it off the beaches. The 2nd Rangers were later involved in the Battle for Brest and the Battle of Hürtgen Forest where they led the assault on Hill 400, Bergstein. The battalion was deactivated after the war together with the 5th and 6th Battalion. The 2nd Ranger Battalion was reactivated on 1 October 1974, as an elite combat unit eight months after the 1st Ranger Battalion. The 2nd Ranger Battalion's colors and lineage was passed from Company H, 75th Infantry Ranger, of the Vietnam War—the most decorated and longest-serving unit in LRP/Ranger history. The modern Ranger battalions are strategic assets, prepared to conduct missions short-notice worldwide. In 1984 the battalion became part of the newly formed Special Operations Command, 75th Ranger Regiment. The 2/75th participated in Operation Urgent Fury in October 1983. During the invasion of Grenada, the 2nd conducted a low-level parachute assault (500 feet), seized the airfield at Point Salines, rescued American citizens at the True Blue Medical Campus, and conducted air assault operations to eliminate pockets of resistance. In December 1989 the battalion took part in Operation Just Cause. The 2nd and 3rd Ranger Battalions and a regimental command and control team, conducted a parachute assault onto the airfield at Rio Hato, to neutralize the Panamanian Defense Force rifle companies and seize General Manuel Noriega's beach house. Following the successful completion of these assaults, Rangers conducted follow-on operations in support of Joint Task Force (JTF)-South. The Rangers captured 1,014 enemy prisoners of war (EPW), and over 18,000 arms of various types. The Rangers sustained 5 killed and 42 wounded. A Ranger from the 2nd Ranger Battalion performing an over watch during combat operations in Iraq. Following the September 11 attacks, the battalion has continuously deployed in support of the Global War on Terrorism. In March 2002, 2nd Battalion deployed to Afghanistan in support of Operation Enduring Freedom and conducted numerous air assaults, raids, patrols, and ambushes against anti-coalition forces. In December 2002, elements of 2nd Battalion again deployed in support of Operation Enduring Freedom, followed in February 2003 by the whole battalion. This period marked the first time in history of the modern ranger regiment that a ranger battalion was required to conduct long-duration and sustained combat operations. The battalion participated in the 2003 invasion of Iraq at the start of the Iraq War, on March 26 2003, B company supported Navy SEALs from DEVGRU in the Objective Beaver mission. On April 1 2003, 290 Rangers from the battalion and 1/75th took part in the successful rescue of PFC Jessica Lynch. 2nd Battalion was also first American force with boots on the ground in Baghdad so they could established a base of operations for follow on units and later participated in operations to capture known and wanted terrorists operating within the country. From November to December 2003, the battalion deployed again to Afghanistan, Rangers pursued enemies in the most remote regions of the country, unhindered by extreme altitudes and bitter cold, the battalion conducted mountain patrols at altitudes upwards of 9,000 feet, mobile patrols through major population centers, and conducted air assaults and direct action raids into heavily defended enemy objectives. As of February 22, 2016, 16 Rangers from 2nd battalion have been killed in the War on Terror. Army Times reported that for actions during their October 2016 to January 2017 deployment to Afghanistan in support of Operation Freedom's Sentinel, 5 Rangers from the battalion received the Bronze Star with "V" device and 5 more received the Joint Service Commendation Medal with "V" device. Primary tasks include: direct action, national and international emergency crisis response, airborne & air assault operations, special reconnaissance, intelligence & counter intelligence, combat search and rescue, personnel recovery & hostage rescue, joint special operations, and counter terrorism. First Lieutenant John P. Abizaid served as a Platoon leader 1975–1976 in Alpha Company and later as the XO of Charlie Company from 1976 to 1977. He went on to command Central Command in the second Gulf War. His change in intelligence methods led to the capture of Saddam Hussein. He retired as a General. Lieutenant General David Barno, commanded 2nd Ranger Battalion from 1993 to 1994. Later became Commander, Military Operations-Afghanistan. Brigadier General James Emory Mace, recipient of Distinguished Service Cross (Vietnam), 2nd Ranger Battalion Commander and the first Commander of the Ranger Training Brigade; 15th Annual Ranger Hall of Fame inductee 2007. Lieutenant Colonel Wayne A. Downing was the third Battalion Commander of the 2nd Ranger Battalion, and eventually commanded the 75th Ranger Regiment, and Special Operations Command. He retired as a General. Captain Gerald Heaney, World War II, landed at Normandy on the early hours of D-Day, Heaney was one of only three still on the front lines with the Rangers on VE Day. He served for nearly forty years as a federal judge on the United States Court of Appeals for the Eighth Circuit. Captain Robert L. Howard was nominated for the Medal of Honor three times for his actions in Vietnam, receiving it once. Howard commanded Alpha Company from approximately 1975–1977. Howard was later inducted into the Ranger Hall of Fame. Sergeant First Class Matt Larsen, father of the Modern Army Combatives system, founder of the United States Army Combatives School. Second Lieutenant Leonard Lomell, served as platoon leader during the D-Day landings. Was awarded the Distinguished Service Cross for his actions. Colonel James Earl Rudder, commander of the 2nd Ranger Battalion during World War II, later major general USAR and president of Texas A&M University, led the Ranger assault on Pointe du Hoc on D-Day. Sergeant First Class Randy Shughart, Medal of Honor recipient sniper who was killed during the Battle of Mogadishu. Corporal Pat Tillman, an American football player who left his NFL career and enlisted in the United States Army in May 2002 and was killed on 22 April 2004. Sergeant Stephen Trujillo, awarded the Silver Star during Operation Urgent Fury, the first Silver Star awarded since Vietnam, after rescuing fellow Rangers from a downed aircraft while under direct enemy fire. SFC Jason Everman, musician best known for playing in grunge bands Nirvana and Soundgarden before enlisting in 1994. Wikimedia Commons has media related to 2nd Ranger Battalion (United States). ^ Marshall, S. L. A. "First Wave at Omaha Beach". Retrieved 26 January 2018. ^ Ankony, Robert C., "H Company 75th Ranger / Company E, 52nd Infantry (LRP) 1st Cavalry Division," Patrolling magazine, Fall 2013: 12-13. ^ a b Pike, John. "2nd Battalion, 75th Ranger Regiment". Retrieved 26 January 2018. ^ a b "75th Ranger Regiment". US Army. ^ "2nd ranger battalion". Archived from the original on 30 September 2013. Retrieved 8 September 2013. ^ "Ranger receives Silver Star for saving Afghan soldier during raid on ISIS commander". Army Times. 19 May 2017. ^ a b David Poe (15 May 2012). "Army Rangers hold rare public ceremony to celebrate service, sacrifice". Northwest Guardian. United States Army. Retrieved 5 November 2012. ^ "Army Ranger to be awarded Medal of Honor". Stars and Stripes. Washington, D.C. 31 May 2011. Archived from the original on 1 June 2011. "Pointe Du Hoc 2nd Ranger Battalion". Small Unit Actions. American Forces in Action Series. United States Army Center of Military History. 1946. CMH Pub 100-14. This page was last edited on 21 March 2019, at 12:10 (UTC).